The knitting continues as usual. 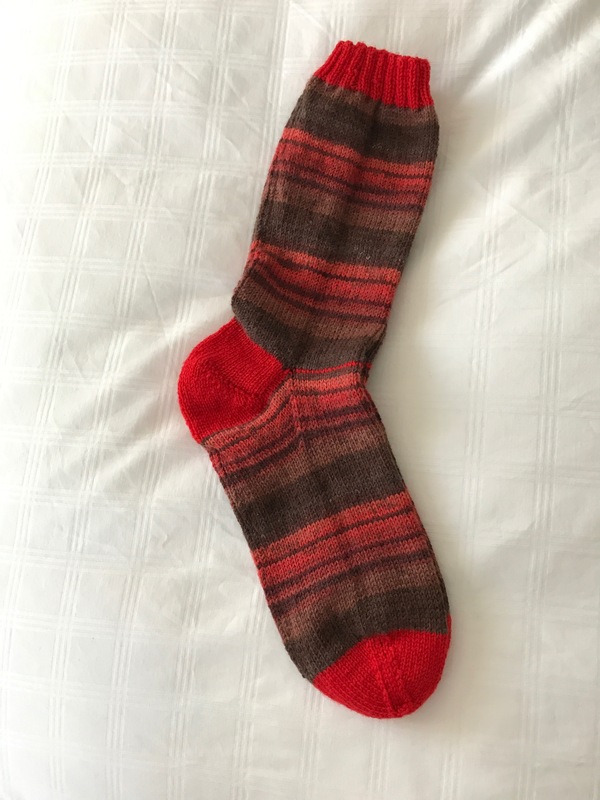 A couple of evenings ago I finished this pair of red/brown socks – they’re in the give-away stash. The next pair of socks got underway. A few days ago, I also started a new quilt. I had a collection of leftover batik jelly roll strips – I sorted through them picking out contrasting lights and darks in a variety of shades (reds, blues, yellows, greens, browns…) and set up sets of four. If I had stitched them together as 2.5″ strips my resulting blocks would have been 8.5″ square which was bigger than I wanted for the quilt I was planning so I trimmed them to 2″ which has given me 6.5″ blocks to which I’ve been adding sashing strips which will finish at 1″ – completed block size = 7″. As you can see in the individual blocks, I’m alternating asymmetrically cut pieced strips with narrow sashing and alternating the sashing direction when I put them together. 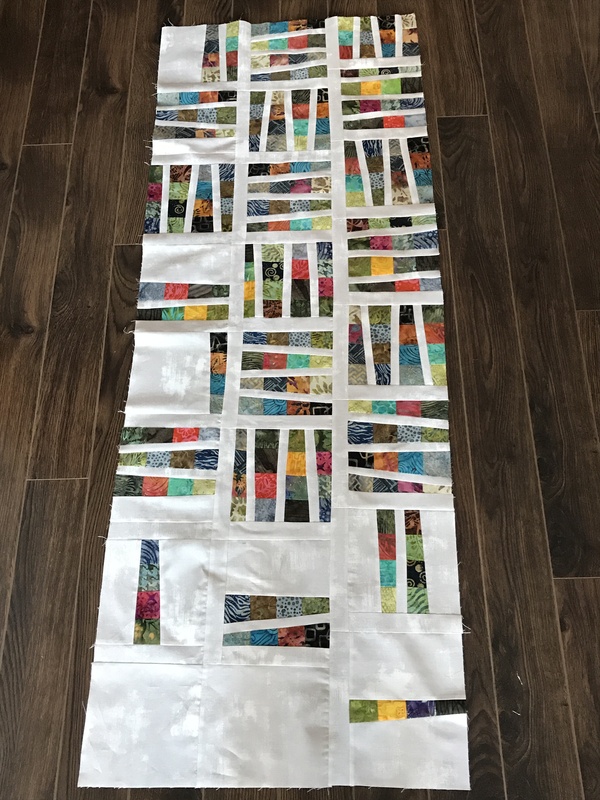 I’ve offset the third column against the second – it’s about making it easier to sew the columns together – the sashing joins don’t need to match up. (I’ll match up the blocks/sashing position in the 4th and 5th columns with the 2nd and 3rd.) It’s also making the content of this modern quilt less regular, therefore a bit more interesting. 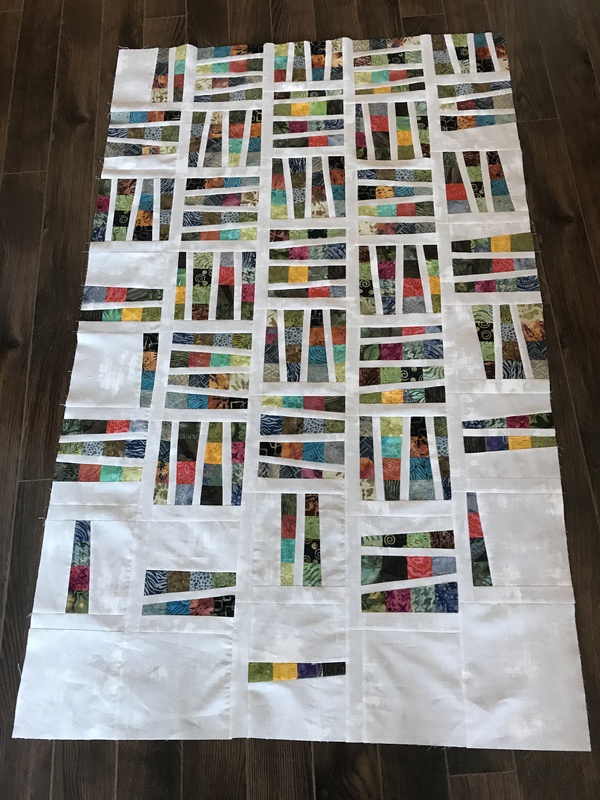 Also, around the outside (on three sides) I’m using fewer pieced strips in each block (you can see that in column 1) to increase the amount of background toward the outside edges of the quilt. 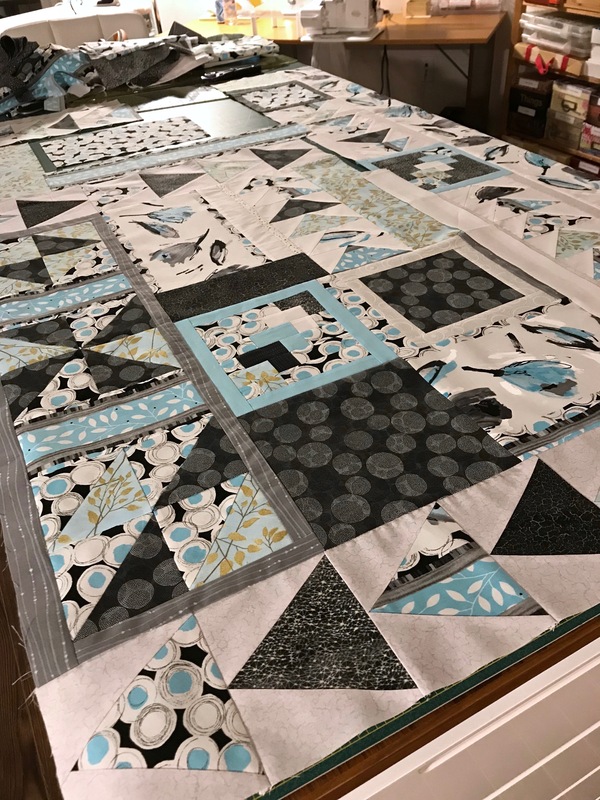 I’m planning a 6 x 8 quilt to which I will then add uneven borders – 3″ on the top and left, 6″ to the right and bottom to extend the background and position the pieced blocks toward one corner of the finished quilt. I’m half way there – I completed three more blocks for column four late this afternoon, I hope to finish the fourth and fifth columns tomorrow which will leave just one column (with blocks composed mostly of background to complete Monday). I have fabric from the original sewn strips sections to use when I go to make the quilt back – don’t know what I’ll do with them, yet (haven’t chosen a backing fabric either – have to go through what’s in the stash and hope there’s something there that might be suitable). The background fabric (a pale grey grunge by Moda Fabrics) I did purchase just for this quilt – I really didn’t have a long enough length of anything that would set up a strong contrast between background and inserted strips. I find it interesting that in spite of the quantity of fabric in my stash I still have to buy fabric each time I go to make a new quilt. I seem to be missing some fill-in colours, or background or backing. The stash just seems to keep getting bigger!